4Life® is a sharing business. The more you share, the more opportunities you have to build your team and increase volume. Start a conversation about 4Life with these helpful ideas. Always be prepared to share 4Life! 1. Share 4Life products at neighborhood events and activities. 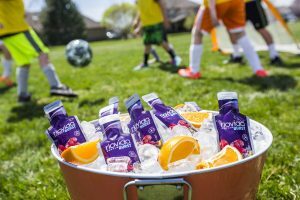 When it’s your turn to bring treats to your Saturday soccer game, why not add a 4Life product to the mix? Other players could become new customers or even join as distributors. 2. Promote 4Life® by wearing logo items when you’re in public. Attending a formal event? Wear your 4Life pin with pride. When people see your 4Life gear, it may start a conversation about your business. Attend convention to purchase 4Life gear in the store. Purchase shirts, caps, and other 4Life logo items at 4lifetools.com. 3. Spread good will in your community by coordinating a Foundation 4Life® service project. Talk to friends and neighbors about how much you enjoy taking part in 4Life service efforts, and ask if they’d like to know more about the 4Life mission of Together, Building People®. Read page 41 for great ways to get involved in the United in Service campaign. 4. 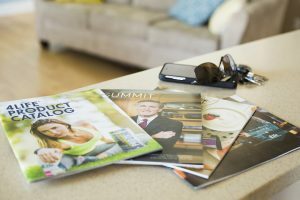 Always keep the 4Life Product Catalog and other 4Life publications displayed on your kitchen counter, desk, or coffee table. When friends visit, they may pick up a copy of Summit™ magazine or flip through the 4Life Product Catalog. This creates the perfect opportunity to answer questions and make a sale. 5. Share photos on social media that illustrate your 4Life® achievements and prompt friends to ask questions. Perhaps a recognition moment on stage during convention or an image of you and your friends enjoying PRO-TF™ after a workout. 6. Keep 4Life products on hand to share at home meetings, and take products and tools with you wherever you go. Always be prepared to make a sale to an interested customer. 7. Going out to dinner with friends? Bring packets of Energy Go Stix®, 4Life Transfer Factor® RioVida Stix® Tri-Factor® Formula, or PRO-TF™ Chocolate packets to share. Once they try these delicious products, they’ll likely want to purchase them.